In India, continuous construction of high-rise buildings and growing government expenditure on infrastructure development have spurred wide installation of elevators & escalators. In India, elevator segment has captured major share in overall elevators & escalators market, where majority of the market installations are witnessed in areas such as residential, retail, transportation and hospitality sectors. According to 6Wresearch, India elevators & escalators market size is projected to grow at a CAGR of 8.1% during 2017-23. In India, gearless & machine room less type of technology elevator is growing at a faster rate than geared type of elevator and is expected to hold the major share in coming years. In escalator segment, moving stairs escalator has led the market, however moving walkway sub-segment is gaining popularity with the installation at airports, and shopping centers. In 2016, amongst all the applications, commercial application captured the largest share in overall India elevators & escalators market share. India elevators & escalators market report thoroughly covers the market by Elevators & Escalators types, sub-segments, services, applications, and regions. India Elevators & escalators market outlook report provides the unbiased and detailed analysis of the on-going India elevators & escalators market trends, opportunities/high growth areas, market drivers which would help the stakeholders to device and align their market strategies according to the current and future market dynamics. • India Elevators & Escalators Market Overview. • India Elevators & Escalators Market Outlook. • India Elevators & Escalators Market Forecast. • Historical data of Global Elevators & Escalators Market for the Period 2014-2016. • Market Size & Forecast of Global Elevators & Escalators Market until 2023. • India Elevators & Escalators Market Size and India Elevators & Escalators Market Forecast Revenues until 2023. 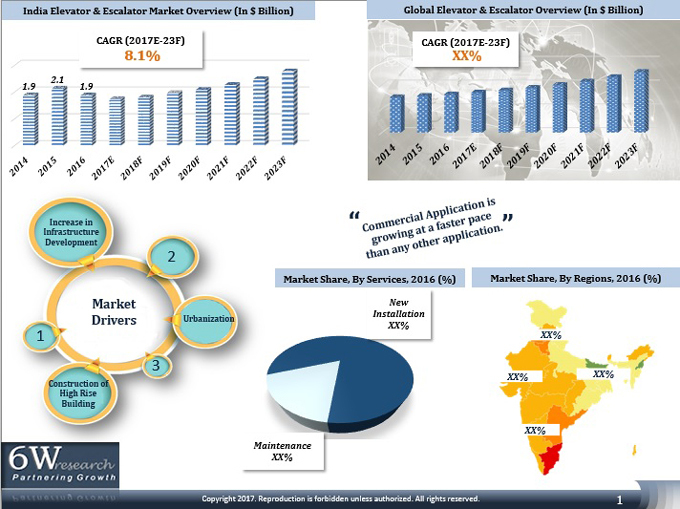 • Historical data of India Elevators Market Revenues & Volume for the Period 2014-2016. • Market Size & Forecast of India Elevators Market Revenues & Volume until 2023. • Historical data of India Escalators Market Revenues & Volume for the Period 2014-2016. • Market Size & Forecast of India Escalators Market Revenues & Volume until 2023. • Historical data of India Elevators & Escalators Application Market Revenues for the Period 2014-2016. • Market Size & Forecast of India Elevators & Escalators Application Market Revenues until 2023. • Historical data of India Elevators & Escalators Regional Market Revenues for the Period 2014-2016. • Historical data of India Elevators & Escalators Service Market Revenues for the Period 2014-2016. • Market Size & Forecast of India Elevators & Escalators Service Market Revenues until 2023. • India Elevators & Escalators Market Drivers and Restraints. • India Elevators & Escalators Market Trends. • India Elevators & Escalators Market Overview on Competitive Landscape. 13.3 Thyssenkrupp Elevator India Pvt. Ltd.
13.6 Toshiba Elevator India Pvt. Ltd.
13.7 Hitachi Lift India Pvt. Ltd.
13.9 Kinetic Hyundai Elevator & Movement Technologies Ltd.